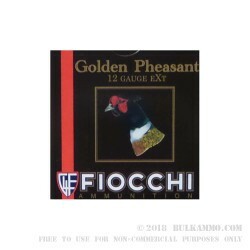 Fiocchi Golden Pheasant loads are made in the USA and were developed here as well. The Fiocchi of America Golden Pheasant Ammunition is one of the highest level 3” 12 gauge rounds on the market today. With Fiocchi's continuous innovation and study in the field, you can bet on Fiocchi Golden Pheasant Ammo for your next bird hunting trip. These shells are 12 gauge, 3” long, have a 1 5/8 ounce nickel plated #6 size shot load that fires at a blazing fast muzzle velocity of 1350 feet per second. These shells come in low brass reloadable Boxer primed 12 gauge rounds, and are available in #4, #5, and #6 shot size for hunting different types of fowl. After the Golden Pheasant line up was developed, it was promptly tested in the Dakotas to be sure it was up to Fiocchis’ high standards. The FoA Golden Pheasant rounds are well-known, widely respected, and remain some of the best shotshells available on the market. Bulk pricing makes it easy to stock up on a case of 250 shotshells for a price that’s easy on the wallet.